On his way to Stockholm, the Nobel Prize winner and New York Times columnist takes time to explain the "awful" economy that looms ahead of us. Paul Krugman at a news conference Oct. 13 at Princeton University, during his introduction as the 2008 Nobel Prize winner in economics. The revised and expanded edition of Paul Krugman's "The Return of Depression Economics," originally published in 1999 but back in bookstores last week, features, in a reasonably large font on the front cover, the mini-bio: "Winner of the Nobel Prize in Economics." The choice of the (re)publication date couldn't be better. Not only are Krugman's predictions of economic doom, first made in the wake of the Asian financial crisis of 1997, even more relevant as 2008 comes to a close, but he is also accepting his award in Stockholm, Sweden, this week. When I reviewed "The Conscience of a Liberal" a year ago, I wrote, "Now is a good time to be Paul Krugman." I spoke too soon. 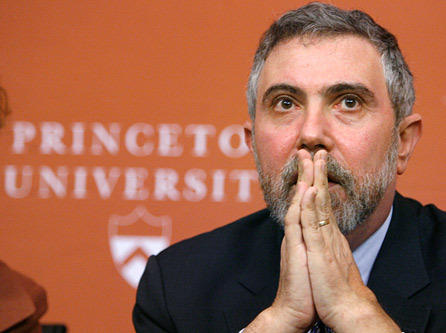 Now is an even better time to be Paul Krugman. The words "depression economics" don't necessarily mean that we are in a depression or inevitably headed toward one. A more accurate definition would be that we are witnessing economic problems reminiscent of the Great Depression, long after many economists concluded that the question of how to avoid depressions had been permanently solved. Not true, says Krugman. If we don't watch out, we could steer the current recession right into depression territory. The Asian financial crisis was a dress rehearsal for the massive financial crisis now shaking the global economy, Krugman writes, and the echoes of the Great Depression are not hard to hear. Krugman believes we are in a "liquidity trap": No one wants to lend money, and no matter how hard the Federal Reserve pushes its various monetary policy levers, it can't seem to get credit flowing again. Worst of all, we are witnessing what happens when too much leverage -- too much money borrowed on risky bets -- becomes a cascade of deleverage, when everyone starts selling assets to raise cash at the same time, forcing financial markets into a downward spiral. As I write these words on Friday morning, the news is breaking that the U.S. economy shed 533,000 jobs in November and that one in 10 U.S. homeowners is delinquent on mortgage payments or is already in foreclosure. It underlines, once again, the appropriateness of putting a book with the title "The Return of Depression Economics" back in bookstores. As he was preparing for his trip to Sweden, Krugman graciously made time to answer my e-mailed questions. He explained he was writing while traveling by train from New Jersey to New York. In 1999, when the first version of "The Return of Depression Economics" was published, the title seemed provocative and its thesis was cavalierly dismissed by conservative economists. But today, fear rules the markets, John Maynard Keynes is back in fashion, and the stars of Milton Friedman and Alan Greenspan are fading. What's it been like to live through this, while, in effect, live-blogging the transition via the New York Times? Is republishing (and revising) the book a big "I told you so" to your critics? First of all, it apparently isn't that obvious that we're experiencing depression economics. Some economists, including some of the prominent econo-bloggers, are still insisting, despite everything that's going on, that there's no such thing as a liquidity trap and that the Fed can easily get the economy moving again. But anyway, yes, there's a part of me that's enjoying the vindication -- and there's probably a bit of "told ya so" in the book. On the other hand, this is really, really scary. I lead a pretty sheltered life financially, yet even so I have friends who've lost their jobs and/or much of their retirement savings, so this isn't abstract. The one thing I guess I can say is that, right now, I'm doing the job the Times originally envisioned me doing, instead of the more political role I felt I had to take during the Bush years. You cover a lot of ground in 200 pages -- Mexico's "tequila" crisis in the early 1990s, the Asian financial crisis, the collapse of the Long Term Capital Management, the dot-com and housing bubbles, and, of course, the great financial crisis of the past year. What do you think is the one thread that links all these crises together? Two threads, I think: leverage and the economic fragility it creates, on one side, and the limits to monetary policy on the other. The collapse of Indonesia or Argentina was all about leverage, and we've seen that replayed in the collapse of securitization in the United States. Japan showed us that central bankers can't always save the day, and Ben Bernanke is seeing that truth right now. You write that some economists (and this certainly goes for many Salon readers) believe that recessions and even depressions are necessary mechanisms for purging economies that have gotten out of control. There's even a moralistic aspect to it: In the U.S., all those greedy investment bankers and housing speculators and overconsuming Americans are getting their comeuppance. But you seem to be suggesting something different: that the government can kick-start the economic machine back into motion, that we don't have to be subjected to the torture of a severe recession. What do you say to those critics who claim that stimulating the economy out of this recession will just lead to bigger problems down the road? My favorite Keynes essay is "The Great Slump of 1930," in which he says "We have magneto [alternator] trouble." If you've got electrical problems with your engine, that doesn't mean you should junk the whole car. If part of your financial system has gone haywire, that doesn't mean that millions of workers have to be unemployed. There's kind of a weird double-think involved in arguments that the slump should be allowed to follow its natural course. It's true that classical economics says that we should let market forces do their work; but classical economics also says that severe recessions can't happen. This idea that we must not intervene is based on a worldview that is refuted by the very fact that the economy is in the mess it's in. We learned with Enron that a lack of confidence can take down a mighty public company in a couple of days or weeks, and now we're seeing the same crisis of faith shake the entire global economy. As you write, even the rumor of a bank run can be a self-fulfilling prophecy. What practical steps can we take to immunize ourselves from debilitating panics? Well, we had about 60 years of financial stability, basically because we had an effectively regulated banking system. Then we fell prey to a combination of excessive optimism and excessive literalism. We started believing that financial markets always work, and we also believed that everything was OK as long as things we call banks were guaranteed, not realizing that lots of things we don't call banks are nonetheless subject to bank runs. So the answer is to relearn our grandfathers' lessons: Highly leveraged financial institutions have to be regulated and insured. In detailing the response that the IMF and U.S. Treasury took to the international economic crises of the 1990s, you write that "international economic policy became ... a kind of amateur psychology, not economics." Every action taken was motivated by a desire to increase market "confidence" and not necessarily by whether it was appropriate for the specific economy in question. Do you think that the same dynamic has played out in how Paulson and Bernanke have responded to the financial crisis this year? They wanted to bolster confidence, but the failure of each discrete action only made things worse. Yeah, the "confidence game" goes bad pretty quickly if there aren't genuine substantive reasons for confidence. I wrote early in 2008 that Fed/Treasury policy was based on the "slap in the face" theory; the late, much-lamented Tanta at Calculated Risk even worked it into one of her Mortgage Pig entries. The answer, again, is institutions and regulations to secure that confidence. And if necessary, you deal with the problem of market panic by restricting the market: temporary capital controls, temporary nationalization of banks. You conclude with a pretty straightforward prescription: Anything that acts like a bank, or that plays a role so significant in the financial system that its failure would require government help, should be regulated like a bank. There should be limits on leverage, capital requirements, and close scrutiny from regulators. Why is this so hard to understand? What explains the growth of the unregulated shadow banking industry to a point where it could imperil the living standards of everyone on the globe? Was it simply the triumph of deregulatory ideology? Ideology played a big role -- but we should also bear in mind that the shadow banking system was making a few people incredibly rich. And that much wealth distorts policy, not just through campaign contributions and the revolving door, but because people who make that much money come across as masters of the universe who know what they're doing. [Economist] Willem Buiter apparently got in trouble at Jackson Hole for saying that central bankers are subject to "cognitive regulatory capture," but it's totally true. There's been a lot of grumbling on the left about the return to the White House of Lawrence Summers and other Clinton-era economists. In the view of many, Summers and Robert Rubin were just as guilty of pushing "Washington consensus"-style privatization and deregulation on the rest of the world, and ensuring that new credit derivatives such as credit swaps were unregulated, as were Alan Greenspan and Phil Gramm. Why should we believe they won't make the same mistakes all over again? Well, they're smart and relatively open-minded, so they're the kind of people who can learn from their mistakes. And you do want people who know a lot about the mechanics of finance and central banking, which is why some of the people being proposed by the left would be problematic. Still, I'd like to see some "people of the left" given roles in the administration, simply to provide a variety of voices. And those of us on the outside should not shy away from being critical; I don't expect to go after the Obamanites the way I went after the Bushies, but I'm sure it won't be all sweets and flowers. How bad do you think this is going to get? Awful. Without a major stimulus package -- sorry, I guess the politically correct term is now "economic recovery plan" -- I'd say that we were definitely headed for double-digit unemployment. Right now the economy is clearly falling as fast as, or faster than, it was in 1981-82, which was a terrifying slump. If Obama doesn't come up with a massive plan, and possibly even if he does, this is going to be a slump that pushes 10 million-plus Americans below the poverty line, and more. And how soon do you think it will be before Republican ideologues start blaming Obama for making it worse? Grover Norquist is already making the claim that the bear market is a result of the 2006 election -- he says investors started dumping stocks because they were afraid of the inevitable tax hikes coming down the road. How do you fight that? To some extent you can't fight it -- people will believe what they want to believe. If they can make FDR the cause of the Great Depression, they can do anything. But one thing progressives can do is make sure that the story of the Bush administration is told, in all respects. There's going to be huge pressure from the usual suspects to let bygones be bygones, to forget about everything from torture to reckless disregard of financial warnings. But I want truth and reconciliation across the board, and progressives have to make it clear that it was an ideology, not an act of God, that made this crisis possible.